This morning I woke up and checked the latest poll numbers at Real Clear Politics. To my surprise, the polling data suggests that Romney currently leads in the hunt for electoral votes. Currently, Romney has 206 votes to Obama’s 201, with 131 toss ups. I found this quite surprising because even though Romney’s popularity had been increasing in recent weeks he hadn’t made much dent in the electoral count. In light of this surprising (and quite possibly brief) turn of events, let’s ponder the mysteries of the Electoral College. 1. What is the Electoral College? Our government’s official website says, “The Electoral College is a process, not a place. The founding fathers established it in the Constitution as a compromise between election of the President by a vote in Congress and election of the President by a popular vote of qualified citizens.” When Americans vote on November 6th, we will choose 538 electors. The number is based on representation in Congress. Each state gets an elector for each member of the House and each senator, and the District of Columbia gets three electors, just because. Most states have a winner-take-all approach, so if a majority of the citizens of Louisiana vote for Romney, Romney gets all eight of Louisiana’s electoral votes. 3. Why should we keep the Electoral College? Every four years Americans revisit this question. Supporters of the Electoral College claim that it prevents the urban centers from having more influence over the election process than rural America. A related argument for the Electoral College is that it preserves the federal character of our system of government. The people of the states are choosing the president, not the people of America. My mother, a Louisiana Republican since before it was cool, loves the Electoral College because she doesn’t want “those liberals in New York and California” to choose the president every four years. I, on the other hand, think the Electoral College ought to be retired. First, I think the federal character of our nation is mostly a patriotic fiction. Second, why should D.C., with a population of 600,000 get half as many votes as Iowa, which has a population of 3,000,000. In this modern age, the civic interests of a Delawarean are not really that different from the civic interests of a New Yorker, but the individual Delawarean’s vote is worth more. 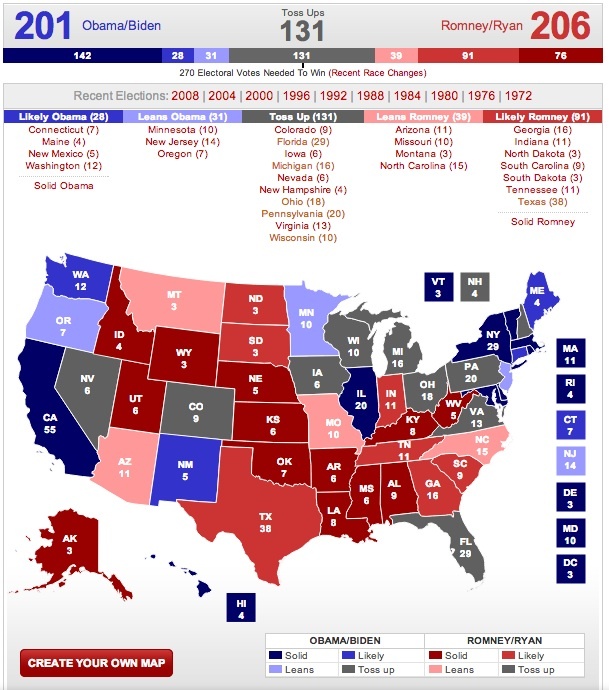 Third, the Electoral College makes most states irrelevant during the campaign cycle. This year, it looks like Ohioans will decide who our next president will be. Both campaigns will spend most of the next month in that state trying to get its eighteen electoral votes. They can afford to take the rest of us for granted. Was this the founders’ vision for selecting the next president? That one or two states would decide the contest for everyone else in this ridiculous winner-take-all system? No. I admit that the interactive electoral-maps are kind of fun and that the Electoral College adds a bit of spice to the election cycle. But I think America should move past this relic from our past. In a country that claims to prize equality, why is it that some of our votes are more equal than others? Feel free to weigh in. Do you support the Electoral College? Why or why not? I like the Electoral College. Stop the hate. Pingback: Do you understand the Election Process in the USA? « It don't Matter!